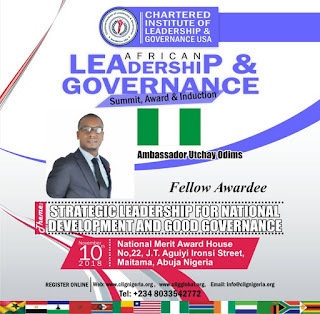 The African Leadership and Governance Summit, Award and Induction, organized by the Chartered Institute of Leadership and Governance in USA, has yet introduced another proactive initiative to build and implement Leadership and Governance skills in the administration of duties across Africa. The program which is holding today, the 10th of November 2018, at the National Merit Award House, Maitama, Abuja Nigeria, will be recognising outstanding individuals and institutions, who are committed in the vision of improving the overall leadership structure of our nation. 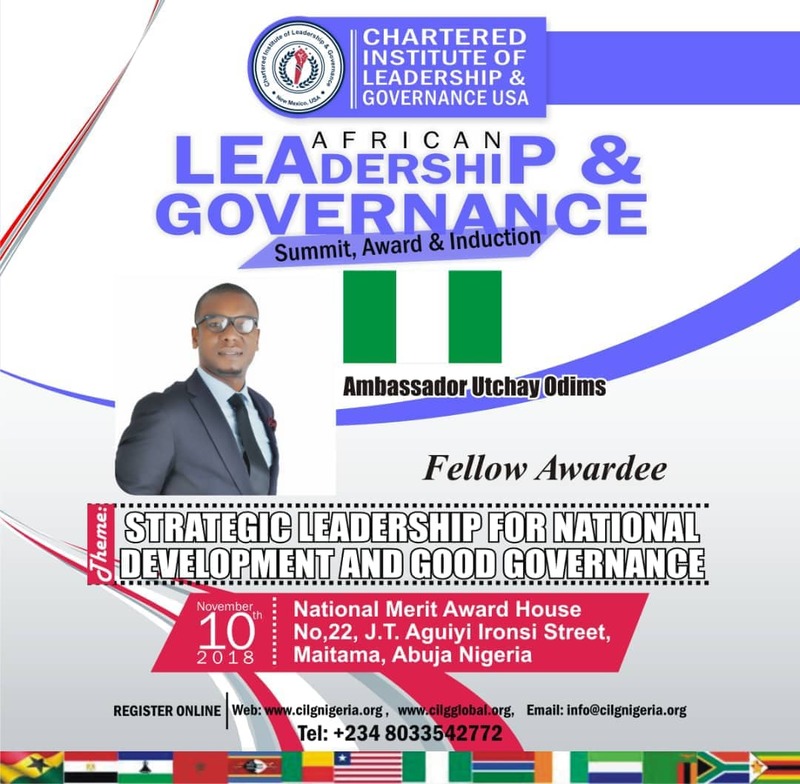 Amongst the distinguished award recipients is Ambassador Utchay Odims, who will be recognised for his advanced innovations and strategic contributions in democratic leadership/governance in Nigeria. Amb. Odims has been an advocate for youth participation in governance and has since been active in campaign for good governance and democratic leadership in Nigeria. According to the Theme of the program "Strategic Leadership For National Development and Good Governance", the African Leadership and Governance program initiative will be raising important discourse surrounding issues of strategic leadership that can accelerate the pace of national development and governance across African nations. The Chartered Institute of Leadership and Governance has overtime displayed her capabilities in bringing about educational and Professional development in Leadership and Governance skills, through programmes that are aimed at preparing and providing leaders with adequate and effective skills to provide solution to our everyday Leadership and Governance problems. However, the program will be graced by reputable personalities in leadership and across all sectors/ professions, who will be speaking on strategic matters that bothers on governance and democratic leadership.